This should be 'as easy as pie'. Answer(s) will be posted and winner will be announced Friday PM (my time). You forgot the pair of slippers next to the cat. What Just Beachin and Jongleur said!! Alternatively, the efforts of someone with access to plenty of baking and decorating supplies and WAY too much time on their hands!! My wife likes it though....... I thinks I see a future hobby in the offing!! A bible on the tray? 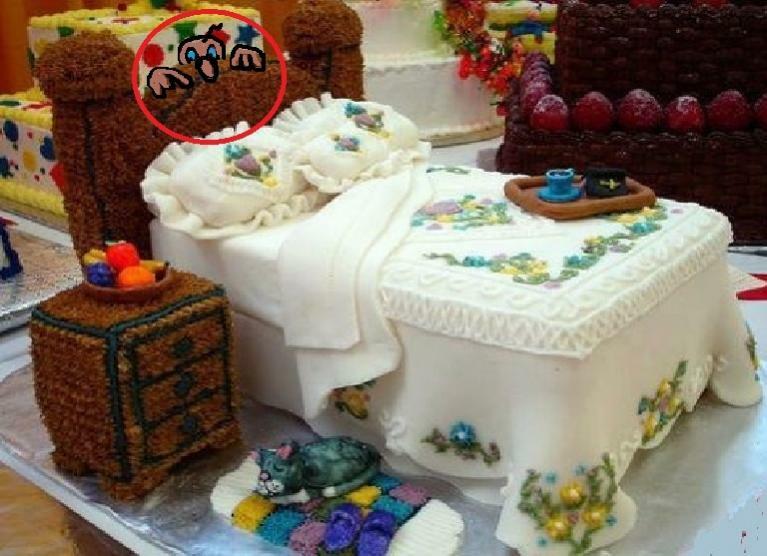 A baker with way too much time on their hands? If you have DSTV, you must watch Cake Boss. My daughter just got the compact package and that is one of the shows and when we visit we watch that. What Ruthie has showed there is small in comparison to what they do in cake Boss. Yes we watch the show - and the boss is certainly a bossy lady! But their creations are magnificent. I see a tablecloth spread on a beautiful green lawn in the shade of a willow tree next to a burbling stream. This cake sitting on one side ready to be dessert. Me and the SWAMBO (She Who Must Allways Be Obeyed) sitting comfortably survying the magnificance which is this picnic of all picnics. The SWAMBO whispering softly in my ear :"Must everything with you allways hint at the bedroom?" Must be another show because this is a guy who owns the show and his family work there. I see blackberry stains all around my mouth, and my bathroom scale crying back," give me a break already, the holidays are over!" ....and the coffee keeps one awake further into the 'wee wee hours'. ... or Wayne. One of 'em got to the pie while it was coolin' on the windowsill. Smellin' a might good 'round here. Who will get the pie? Dead Spiderman on the back right. Inhaling too deep, Wayne. Smaller, shorter sniffs. Granted, 'wild' berries were used to make the pie, but not that wild.... and no pesticides. Those are Genetically Modified berries I can tell. Be warned Wayne. Be warned!